Albuquerque, N.M. - The Duke City Gladiators (5-5) control their destiny when it comes to keeping their playoff hopes alive. Utilizing a crucial bye week to rest up, heal, regroup and adjust is just what the doctor ordered. The major adjustment... bring back last years starting quarterback Kasey Peters. It's all in the hands of the Duke City Gladiators when it comes to post season play and this Saturday will set the stage for the Southern Division of the CIF. 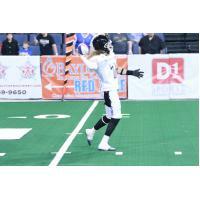 The Gladiators will face the Amarillo Venom (6-4) for a third time this season as each team has won one game a piece. The Gladiators started the 2016 season on a strong pace winning four in a row, but had a quick change in direction when then starting quarterback Bryan Randall broke his arm against the Texas Revolution in Albuquerque back on April 29th. Head Coach Dominic Bramante needed to adjust quickly as Duke City dropped to a record of 5-5. The much needed bye week for the Gladiators gave the organization time to make this critical readjustment. What do you do when your star quarterback goes down and the position can't right itself with the backup? You bring in former Gladiator star QB Kasey Peters. Last season, Peters had a total offense of 1,906 yards which included 34 touchdowns and lead the league in average passing yards per game which was 239.8. He had been recently playing his 2016 season in the Arena Football League (AFL) with the Portland Steel and played with the New Orleans VooDoo and Las Vegas Outlaws towards the end of 2015. Coach Bramate on Peters returning, "I am very excited to have Kasey back in our line up to help us finish this season. He was an asset last year and I know he is capable to leading our team to a playoff berth." This game on Saturday will be an exciting matchup that all fans will enjoy and one not to miss. Saturday's game is also Police and Fire Appreciation Night where fallen heroes including BCSO Deputy James McGrane, Rio Rancho Officer Gregg Benner, Albuquerque Police Officer Daniel Webster and other fallen heroes will be honored. There will be a live auction of player's custom fire/police jerseys after the game, Bernalillo County Sheriff's Office K-9 demonstrations, fire trucks, kids activities and fans are encouraged to come early and tailgate! The Gladiators face the Amarillo Venom in a rubber match this Saturday May 28th in Albuquerque, NM. Kick-off is set for 6:05 PM mountain time at Tingley Coliseum and tickets start at $10. The game can be watched online at dukecitygladiators.com/watch.